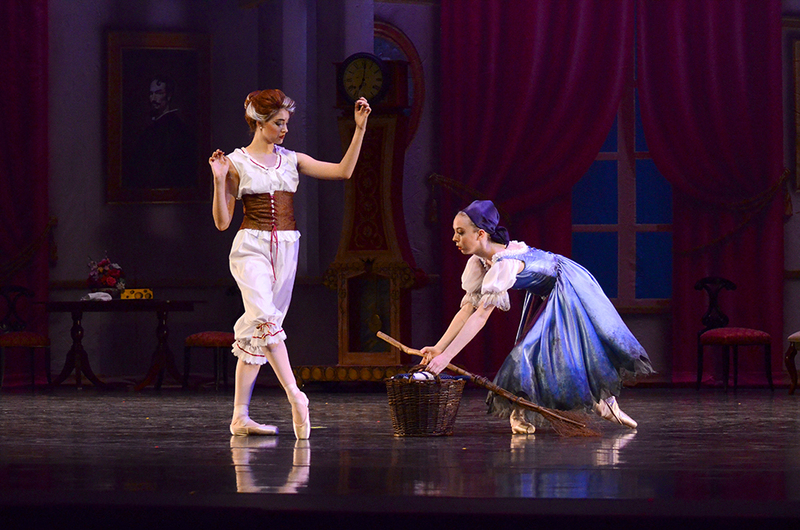 Before I began to choreograph Cinderella, I looked at tradition and non-traditional versions of the ballet and noted the elements I enjoyed and those that I found to be missing. I then pieced together a synopsis of the ballet for Maple Youth Ballet based on those thoughts. The concept of Cinderella can be traced back centuries and individual elements of the story can be found in almost every culture of the world. Told by bards and entertainers from the ancient world, the story has passed from culture to culture and age to age. With each transition it has been altered, embellished and reworked to make it more immediate to its audience. It is impossible to know the exact number of tales (some are replicas of each other, while others have changed so much they are barely recognizable), but it has been estimated there are at least 3,000 variations on the theme of Cinderella worldwide. The Cinderella story is perhaps one of the most well-known fairy tales in our culture. The version most Americans know best first appeared in Frenchman Charles Perrault’s Tales of Mother Goose, a collection of fairy tales for children, in 1697. The popular Walt Disney animation was based on this version. Perrault simply wrote down a story that had been well–known all over the world for more than 1,000 years. The story is known as “Ashputtle” in France, “Yeh-Shen” in China, “Mufaro’s Beautiful Daughters” in Africa and “Vasilisa the Beautiful” in Russia. A few important details stay the same in all of the stories. The Cinderella character’s mother has usually passed away, and the father has remarried. She is forced to perform menial tasks for her stepmothers and stepsisters, like starting fires and cleaning. In some stories, the girl’s name (Cinderella or Ashputtle) refers to her daily chore of cleaning up the cinders and ashes. The stories usually mention the stepmother and stepsisters’ jealousy of Cinderella’s natural beauty and gentle personality. Then, when a prince or king begins searching for a wife, competition develops between the sisters. Because of Cinderella’s kindness, though, she is given help from fantasy-like people: a fairy godmother, magical animals, etc. So with all of this information I set out to begin the process of actually piecing the different elements of the ballet together. Now, I do not consider myself to be a great choreographer; I would prefer to think of myself as an arranger of dances. I gather ideas, see what I like, change the order of things around a bit and see what happens. Ideas can come to me from all sorts of places; watching other ballets, from the suggestions of the dancers, the recent winter Olympics, even people walking on the street, cartoons, musicals, and so on. Very often an inadvertent move by a dancer or a flash of inspiration provides an unexpected solution to a choreographic problem. It is not necessarily the originality of the steps that is important. Someone, somewhere has already done almost everything that the human body is capable of doing. Instead, it is the way the moves come together and create an effect that is important to me. It begins with conjuring up wonderful characters from our dancers. That step helps me focus the choreography to be both understandable and enjoyable. I was never drawn to the idea of having the two stepsisters portrayed by men, as is tradition in the British pantomime. 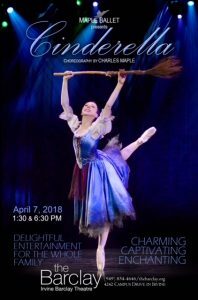 As my ideas came together, and as I had to deal with the number of dancers available to me within Maple Youth Ballet, I was drawn to having the stepsisters and the more menacing stepmother danced by real women. I also found the father figure to be an awkward character who should have been doing more to protect Cinderella, so I decided to dispose of him altogether and leave Cinderella a stronger girl, able to deal with her nightmare family alone. She did, however, need some friends to share her life with so after some thought, I settled on a cat and a mouse. I decided to do away with the fairy godmother and instead used the concept that Cinderella’s mother is the spirit driving the ballet forward. A scene that always bothered me in the traditional interpretations of the ballet was the obligatory dances for the four seasons. It was not the dancing but the fact that the seasons had nothing to do with the story that bothered me. Also the scene took Cinderella away from her house before the magical transition of the pumpkin into a carriage. I do have a dance for three fairies, but they are only there to abet the spirit mother. Having settled on the story, I now had to come up with the plotting of the choreography and the actual steps. 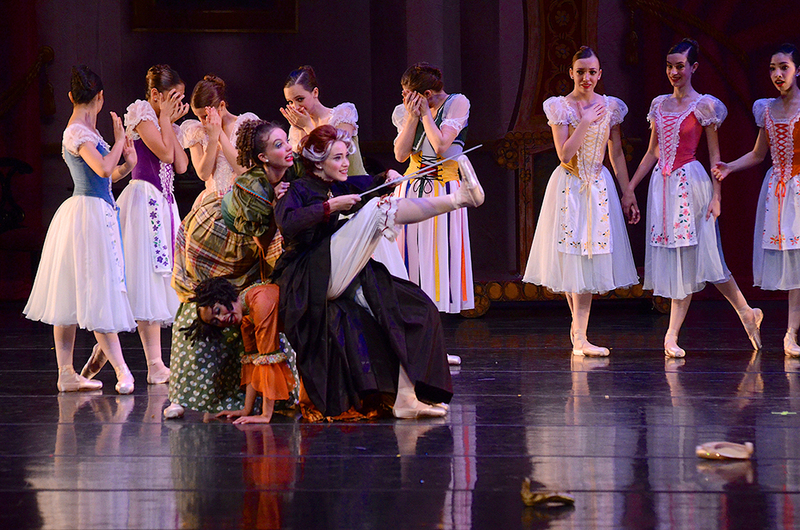 I normally like to work from the beginning to the end of a ballet in sequence, but that was not to be. It always takes a while for the elements to sort themselves out and more often than not when two large chunks of choreography meet there has to be some adjustments made! I chose to use young dancers from the Maple Conservatory of Dance in this production as I believe the opportunity to perform is a valuable part of their dance education was well as an enhancement to the ballet. In Cinderella, I wanted to maintain the magic of a fairytale, combined with good dancing, an easily followed story line, humor and romance. I trust that by our opening the correct balance will have been achieved. The dancers have been remarkable in the process and each successive rehearsal has brought more and more individual dimension and understanding to the work as it fully takes on a life of its own. What I ultimately hope for in this production is to express the poetic love of Cinderella and the Prince, the birth and blossoming of that love, the obstacles in its path and finally, the dream fulfilled. I can’t wait to see the results on stage.